We can’t thank you enough for braving the sweltering heat to swap dresses & pretty things with us last night at 40Berkeley! All of our favorite photos from #DressSwap are now up on our Facebook page — yippee! Tag yourself, your friends, grab them for your blog recaps, and share your pics/posts with us, too! Also, if you loved the garden courtyard at 40Berkeley as much as we do, join them for an hour-long PranaVayu Vinyasa yoga class with Bre Nourse next Wednesday night at 5:30! Tickets are $15 through Eventbrite. Our friends at Zoora were on hand selling pieces from their first ever Capsule Collection of beautiful, bespoke dresses (all under $100!) and their in-house seamstress, Erin, was making custom alterations on-site. 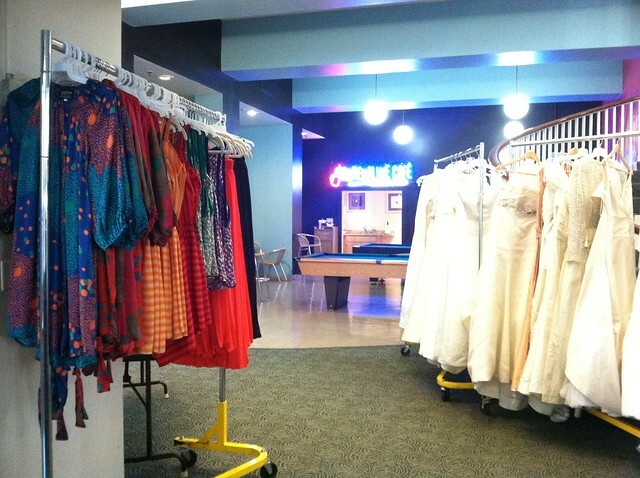 Goodwill Boston was also on hand selling a select few brand-new discounted designer wedding gowns from their Brides on a Budget event, curated by us, and 6 lucky brides went home with amazing wedding dresses! Many of you lovely ladies asked where you can find 90+ Cellars, Boston’s own winery, in stores near you. Good news! Snap up a case or two for all your summer parties and get the most bang for your booze budget with their handy store locator on NinetyPlusCellars.com. They’ll be back for our next swap on July 18th, too! In the meantime, be sure to follow them on Twitter, Facebook, and Pinterest for fun wine ideas. Rock the Aisle was also on hand doing a DIY perfume bar! If you want to try this at home, pick up a DIY kit for your next girl’s night in, shower, or bachelorette party from Ka-Mil-Yin at 15% off any item through July 31st, 2012 with the code SWAP. Founder Emily just hosted the exact same DIY perfume bar at Giuliana Rancic’s baby shower last week! Be sure to connect with Rock the Aisle on Facebook, too. Our favorite Independent Velata Consultant, Robyn, was on hand with her yummy Velata Fondue! Did you ooh and aah over the Goodwill Boston designer bridal gowns? If you’re looking for a similar deal for your own upcoming wedding, or are looking to sell your gown from a wedding past, our friends at PreOwnedWeddingDresses.com are offering swappers an exclusive discount! Use the code WSSSFREE for a free accessory listing or the code WSSSDRESS for 50% off a dress listing, now through July 15th, 2012. Owner Josie is a peach, and she has more than 15,000 brides in her community looking to be chic and sustainable on the cheap! STAY TUNED: tickets go on sale next week for our July 18th and August 8th events with 90+ Cellars at 40Berkeley! See you soon!